THE best ideas in business often germinate in a pub. Outlandish concepts somehow seem more sensible when viewed through the bottom of a pint glass. When Ambarish Mitra, an entrepreneur, suggested to Omar Tayeb, a computer-science graduate at Imperial College London, that technological trickery could alter the still portrait of the queen on a British £20 note, the seed of an idea was planted. That idea became Blippar, a “tech-based advertising platform” which has a million active users. Previously, advertising’s conjunction with technology was limited: internet users were encouraged to visit advertisers’ websites, or at best a clunky quick response (QR) code—a black-and-white square bar code— was tacked onto posters. Blippar has sought to rework the advertising experience using augmented reality. (As with many tech start-ups, the company has its own lingo: adverts, or “blipps”, are “blipped”, rather than scanned.) Users hold up their phones or iPads to an advert. After reading the layout of the image, and connecting it with the app’s ad database, Blippar then takes users to a website, or overlays video or game content on top of an image. According to internal company data, the average user engages with an advert for 4 minutes 36 seconds—significantly longer than television or print equivalents. Blippar is competing with others in the augmented reality (AR) sector, including Aurasma, which is part of Autonomy, a company owned by Hewlett-Packard, that operates in largely the same way, but calling its connections with users “auras”. More than four million people across 100 countries have downloaded the Aurasma app since June 2011, 70% onto their phones. A quarter are active users at any one time, says Matt Mills, global head of partnerships at Aurasma. Big names are also entering the fray: Amazon and Google are putting their money and expertise behind in-house AR projects. Many companies are testing AR’s capabilities in their advertising campaigns. Universal, Tesco and KFC have used Aurasma for marketing purposes. Unilever, Samsung, Nestlé, Nike and Cadbury have all enlisted Blippar’s help rather than creating their own branded apps, which generally have a shelf life of only 17-20 days. Now approaching its second year, Blippar is rolling out beyond Britain’s borders. 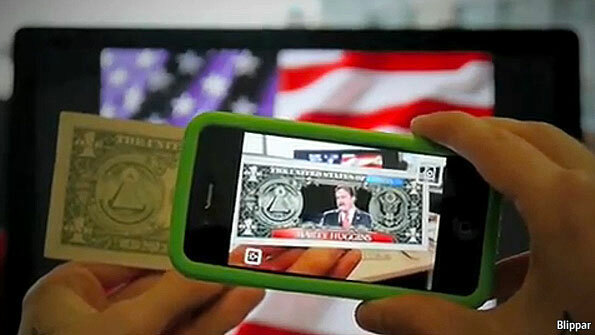 Even Hollywood has got on board: moviegoers in the United States can view a trailer for “The Campaign”, a political comedy film starring Will Ferrell, by blipping a one dollar bill (see picture above). The actors supplant George Washington on the bill, and launch into their political stump speech. But the app’s most intriguing uses are not just in advertising. Stylist, a free weekly lifestyle magazine, created a live Olympic leaderboard with Blippar in its magazine for the 2012 London games. By blipping a page of the magazine, readers could see an up-to-date medals table that ran live data on the latest Olympic wins: 7% of the magazine’s readership did so in the seven days following publication. This echoes the work of Layar, a Dutch AR platform, which focuses on extending the usability of print formats—such as magazines and postcards—with interactive digital content. The technology’s flexibility could go further still. Museums and historical sites, for example, could make good use of AR: the Forum in Rome could be scanned, triggering a computer-generated reanimation of the ruined site to its former glory. Educational narration could explain a building’s use as the app rebuilds it, stone by stone. For now Blippar will not actively court such opportunities, says Mr Mitra, but will not turn down any approaches. Aurasma, by contrast, makes great play of the fact that 20% of its app’s use is in an educational context. Teachers are adding contextual notes to homework that can be revealed by students using the app. But no matter how interactive homework is, children prefer to play. Zappar, another AR app, bases its business on T-shirts and greeting cards that turn into interactive games. There are drawbacks to all these platforms, though. To interact with an advert, people need to download and install the requisite app. Many of their uses are at present little more than follies—moving pictures superimposed on a static page. But the technology is still young, and once hooked, explains Mr Mitra, users are loyal to Blippar. People using it for the first time do so seven times within a month of downloading it, across multiple campaigns. Within six months the company plans to move to a business model that would see continual, daily engagement with the app. Aurasma’s five-year plan includes promoting more user-generated content. Augmented reality’s future success is dependent on changing attitudes towards the technology. “We want to get the whole world tagged up with auras”, says Aurasma’s Mr Mills. “Everyone is carrying supercomputers on their palms,” believes Blippar’s Mr Mitra. “We want to leave a legacy of interacting with your environment through your phone.” And yes, that includes blipping, then decorating, a pint of stout in your local watering hole.